COFFEE AT DE EENHOORN – My family and I were introduced to De Eenhoorn coffee and tea house on the very first day that we moved from Los Angeles to Kampen. It is a beautiful, cozy cafe and adjoins De Olifant cigar shop – famous for its Kampen cigars. De Eenhoorn serves delicious drinks and pastries, the service is welcoming and friendly, and the unique, historical atmosphere always made us feel so connected to genuine Dutch culture. My favorite drink is the cappuccino. I can’t find anything quite the same now that I’m back here living in the States – with foam so firm that you can rest a spoon on top. Any time we had visitors in Kampen, we would take them to De Eenhoorn for a special treat. And what a delight it was to receive De Olifant cigars as a gift upon my doctoral promotion from the VU Amsterdam! I am so happy to hear that De Eenhoorn is now an official partner of Kampen and Beyond! Guests will certainly enjoy learning about the unique living history of Kampen’s industrial expertise in coffee, tea, and cigars. 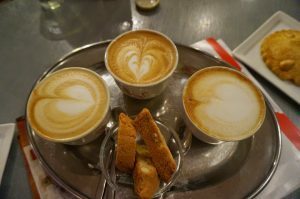 And then, to sit and relax with a delicious cappuccino and pastry – that is something you will not want to miss!